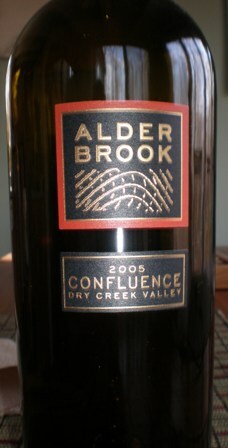 We picked up the 2005 Alderbrook Confluence at Alderbrook during our visit in November. Typically Confluence is only poured for wine club members but the tasting room associate hooked us up. A very nice wine that had a lot of the classic Zinfandel flavors, and the higher than average alcohol was not out of balance. Surprisingly it was a little watery and flat in the middle but up front it was full of rich dark fruit and nice espresso flavors. The back end was firm and griping, evidence of the predominant Syrah component, giving a long dry finish. Although a bit pricey, it was quite good and comparable to other big name Zinfandels at similar price points.